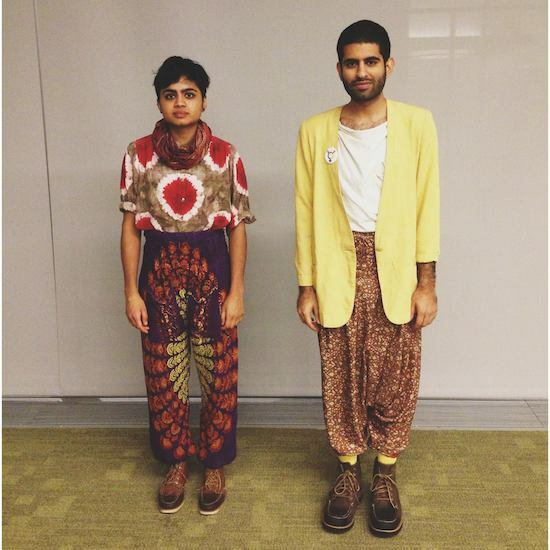 DarkMatter, the self-described queer South Asian “artist/activist/hivebrain” duo of Janani Balasubramanian and Alok Vaid-Menon, seem to be doing everything they can to start a revolution – from their electrifying poetry and essays to their organizing work with the Audre Lorde Project. Their writing draws from personal experience, but it’s an experience that is inherently political. Their art and activism are tied to one another, impossible to divorce. DarkMatter’s poems are kaleidoscopic. There is a moment in ‘White Fetish’, in which Alok says, slyly, already anticipating the punch line, “You know, I’ve heard that white men have huge…” Insert beat. “Empires,” Janani responds. It is a line that is biting, self-aware and undeniably funny all at once, in a poem that effortlessly and critically discusses dating white men, gentrification, colonialism, Islamophobia and the non-profit industrial complex. 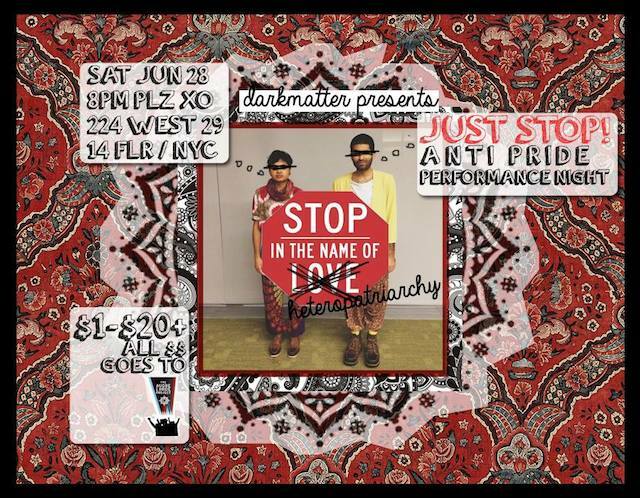 The first time I saw DarkMatter perform was this June at the Nuyorican Poets’ Cafe. The event, titled, ‘Rainbows Are Just Refracted White Light’, was a performance of spoken word poems on white supremacy, the South Asian diaspora, patriarchy, the ‘gaytriarchy’ and trans* rights. When the show ended, and the lights went up, I managed to eke out “This was amazing” to Janani after the show, but I was genuinely speechless afterwards. As a desi girl grappling with many of the same issues they write about, it felt like a small revolution in itself to hear them take these experiences and make them into poetry. Alok describes DarkMatter as being a question that they had put out to the world, but to me, they feel like an answer. I spoke to Janani and Alok on Google Hangouts about radical desis, the legacy of Partition, Twitter poems and The Perks of Being a Wallflower. Read the conversation, condensed and edited, below. If you like what you read, come see DarkMatter perform alongside Christopher Soto (a.k.a Loma) at our next Mouth to Mouth Open Mic tomorrow, August 13 at 7:00 p.m.
Alok: I feel like the reason that I’m attracted to spoken word is because of its political implications. Often I’ve found literary spaces to be too apolitical and political spaces lacking in creative and cultural work. Spoken word allows us to communicate political narratives in a way that makes us feel. So much of political discourse doesn’t recognize that we’re bodies with feelings and sensations and affects. I think performance and spoken word allows us to tap into people’s whole selves versus just their cerebral or logical self. Janani: I think it’s really funny that in a lot of the literary world people have this really narrow idea of what spoken word is, which is that it’s only slam. That’s definitely part of it, but I think that the fundamental base of spoken word is just body plus poem and both of those things doing work together. A myriad of emotions and ideas can be expressed through spoken word. You just have to let go of the idea that it’s a certain type of form and there are certain types of messages that can be delivered in it. That said, obviously both of us work in a number of different forms. For me, I value poetry and fiction and prose I think they each do different work. They can each express a message in a different way. Do you ever use Twitter as a source of inspiration or flesh out ideas expressed in tweets for other work? A: I use Twitter when I’m just like thinking sporadic thoughts or ranting or like, I was recently home and all this small but meaningful stuff was going on and I was just like ‘I’m going to do Twitter poems’. I’m not that intentional about it, it just comes. The times that we’re thinking really intentionally about it are when we do like, hashtags or political teach-ins or whatever. Other than that it’s just like our fridge, I don’t know, we just like throw things into it. J: I think part of that really just comes from limitations on time, Twitter – there’s like really amazing things happening on it, but it’s also just like a whole other community to get involved with. There’s already so much happening around us. A: That said, I think we both appreciate a lot of what Twitter has done. It has really provided a platform for a lot of oppressed people, to share their work and connect with one another. I actually feel like on Twitter we can create spaces that come closer to the types of conversations we’re trying to have in person that often feel impossible because of things like structural racism and ableism. Who were your favorite writers growing up? J: For me, both growing up and now, the strongest influences in terms of what stories have stuck with me and have been important for me have been fairytales and myth. I like playing with fairytales and mythology because there’s this long establishment way of telling the same story different ways. It’s like working with a body already. Stories are ways for us to re-narrate and renegotiate the way that things already are in the world. I think there is something really cool and exciting about being able to play with stories that people understand a certain way. I’m working on a novel based on one of two major Hindu epics, the Ramayan, and it’s based on a particular monkey demi-god character whose prophecy exists as long as the story is still being told. There are so many tellings of the Ramayan, many of which are rooted in castesism and many of which are rooted in caste resistance. There’s a lot of violence to the way the story is used in the same way that there is a lot of violence in a lot of how mythology is used. The novel is him across time and space dealing with and encountering different kinds of violences and apartheids, and also everyday life. It’s a science fiction novel in that I think mythology is a science fiction form in a lot of ways. A: I used to read a lot of really angsty young adult fiction. In particular The Perks of Being a Wallflower has and will continue to be one of the most seminal texts in my creative life *laughs*. Because I feel like the biggest inspiration that I draw is from angst as a feeling, and I don’t think I ever outgrew being 13. So that’s still really influential to me. J: *Laughs* Oh, you know. Ourselves, our families, our friends, our community, whatever that means, cyberspace. We have some poems that are just, like, telling white gay people things. A: I think Janani and I got into creative writing and got into this collaboration because we felt like, at the time, we didn’t see that many public, politicized South Asian voices at all. And we wanted to create the possibility of a queer Indian activist voice because, in a lot of the social movements we were a part of we just didn’t see that perspective. For us, our art is really inextricably linked to our social movement work. 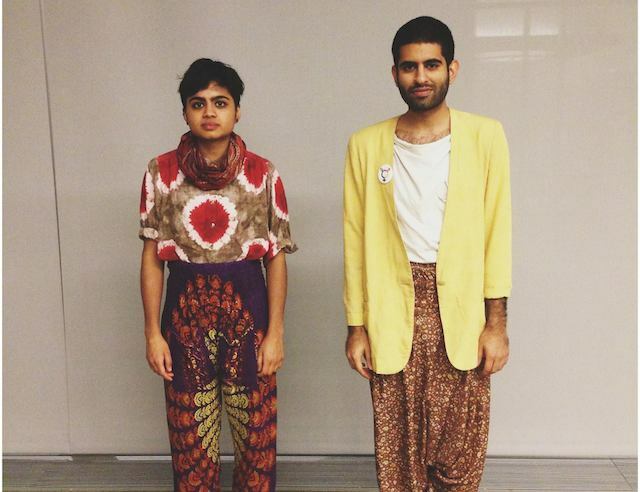 Since that time have you see a lot of growth in terms of a queer South Asian community? J: Yeah, I think one of the great parts of being a traveling performer is that we get to travel and meet people *laughs*. J: And then we got answers! A: Our first tour was literally arranged by people who I met through tumblr. *laughs* It was pretty awesome. So now I feel like we have a pretty sizable, not just queer South Asian community, but progressive, actual activist South Asian community. J: Which is really great. A: The other thing too is that there have always been queer desi artists, there have always been radical desi artists, but the way that white supremacy works in the world makes it so that these people find it very difficult for their work to go mainstream or whatever. Now in New York I’m connected to a lot of other artists who’ve been doing this stuff forever and whose work was foundational in creating this space for us. We didn’t really know about them until moving here. Who are some of those people? 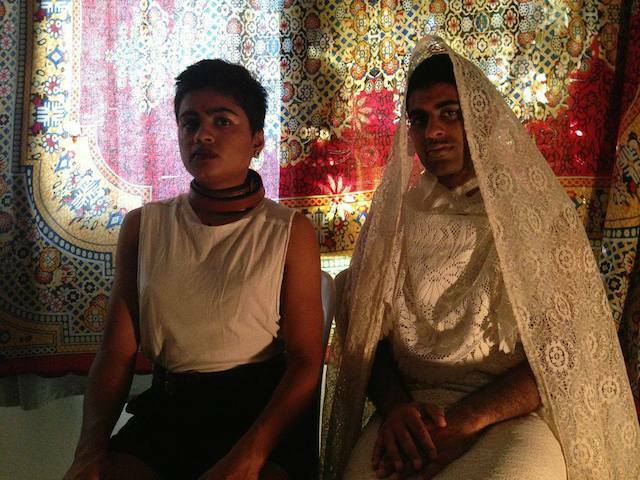 A: There’s YalaniDream, who’s a queer, Tamil spoken word artist, who’s been doing this stuff forever. There’s D’lo, a trans Sri Lankan comedian and performer who’s been a really great mentor for us. There’s people like DJ Ushka, our friend Thanu, who is a Sri Lankan DJ doing a lot of really great stuff in New York. Who else, Jan? There’s so many. J: There’s so many I don’t want to keep going on a list and miss people. A: I mean like, through DarkMatter stuff I found this political scholar named Ronak Kapadia, who has been a really great mentor for me and he’s now on faculty at the University of Illinois at Chicago. Basically like the more that we write the more that we find queer South Asians. Our friend Minal [Hajratwala] went to our school and we had no idea that she existed. And then she presented a book at our school [Out! Stories from the New Queer India] and we were like ‘What! Who is this?’ *laughs* And then we met her and we were like ‘Oh my god.’ So many of us are using writing not to just put our own stuff out there but to build community as well. Speaking of that community, I went to your Anti-Pride reading which was one of the best readings I’ve been to in terms of the atmosphere and feel of the room, which was really wonderful. I was wondering how do different audiences react to your work and if you have any kind of best or worst experiences in mind. J: Oh my god, we have so many great ones. I love making people walk out. I consider that a great success. We’ve definitely done shows where people have walked out. We’ve had shows where certain people in the audience were not paying attention. We’ve had a lot of shows that are really amazing, where the audience is super attentive. I don’t think of it as one show is a success and another is not. I think every experience with an audience, in which you’re being challenged or pushed is just an interesting thing that has happened. A: I’ve noticed a distinct shift in the composition of our audiences in the past year. I feel like when we first started it was very much like, fringe. Like people who were really weird, like queer trans people of color, very much communities we identified with. And now that our work has picked up more, we have more people that stumble into the room from random things they’ve seen of us and don’t know the entire composite of our work. So they’re kind of perplexed, and often very confused that we’re actually very politically charged. I think one of the things we’re always combatting, and I think this is one of the ways that white supremacy actually works in the creative world, is that South Asians are expected to be docile and quiet. We don’t really have that many models of angry and politicized desis. I feel like it works to our advantage in some ways, because people are like, ‘Wow, you’re political? That’s exciting.’ But then people will also be like, ‘Well this is not what I was expecting.’ We get flattened into the trope of ‘Angry Brown Person,’ which I think is an extension of racism because we’re not allowed to be seen as a complex mixture of different sorts of methods. Do you have any poems/performances that seem to get the biggest negative or positive response from people? A: I made a really funny decision to do a Ted Talk in November, and I did it because of that very reason. In the beginning I felt like we were having audiences of people who got it, and as an artist that feels great but also as an activist I was thinking, how do we actually help shift people’s consciousness? Who I presented in that talk was a very strategic image of myself, to appeal to people who wouldn’t normally read the rest of my work. My hope was that they could transition from that into the other stuff. Often that’s an awkward transition *laughs* but, we’re trying. J: There’s a poem about trans-ness and parents and my family that got a lot of shares, etc. I think of that performance as part of my politically strategic canon of work. I think the performances that excite me the most are actually really quite subtle poems that make audiences go completely silent. Those are my favorite performance experiences. Two of my favorite spoken word pieces by you guys are ‘White Fetish’ and ‘Bollywood Divas’ which are both really, really funny poems despite the seriousness of the issues that you discuss. Where do you see the role of humor in your writing and discussion of oppression? A: I draw a lot of inspiration from the tradition of queer, camp and femme. People will call us funny, or whatever, and then they’ll be like ‘Have you ever considered comedy?’ and I’m like, ‘What?’ This is just how our friends speak! It’s how we communicate. The way that we often talk about politics within our communities isn’t just formal and dry, we also find humor in all of the oppression, like: ‘Girl that white man is so basic, blah blah blah’ *laughs* We’re always inventing new language, and inventing new jokes. Can you talk about the time you spent in Palestine with Al Qaws and the writing and performance workshops you conducted? A: So last summer, in 2013, Janani and I went to Palestine where we did a series of workshops and performances in the West Bank and the 48, known as Israel. It was awesome. When we were going in we didn’t know what to expect at all. I think it ended up being really foundational in how we approach our practice. Al Qaws was where we really saw clearly the connection between art production and social movements, because Palestinians are people coming at their work with incredible trauma, with incredible analysis and critique of state violence. It seemed kind of futile to make art that wasn’t relevant to the struggle. So we held political education workshops mixed with creative writing workshops and that creative writing became part of our social movement building. That was such an exciting and dynamic space where the people we were writing and growing and collaborating with were looking at their work with a similar anti-colonial frame. We weren’t just collaborating with formal activists or people working in the non-profit sector but we were collaborating with other artists and made relationships that summer that have continued on to today. We’re always thinking about how to use our privilege as American citizens to speak against the crisis that’s happening right now in Gaza and elsewhere. J: I agree with everything Alok just said. I would also say that, I really valued the experience in terms of the friendships and comradeships that we built when we were there. So much of solidarity work gets framed as you visit a place and you learn from the place, as opposed to when you actually learn from and grow with the communities that you build. I also really valued it as a time where we got to build and grow together as DarkMatter, as the two of us, *laughs* because it was like two months that we had to spend with each other. It was valuable that way as well. How do you view the legacy of Partition and how do you address it in your work? A: Partition is really influential to my work and I only started making those connections recently. I think one of the foundational traumas in my family growing up was the specter of Partition. My grandparents were so influenced by that moment; they were both from land in what is now Pakistan and had a lot of family there, and really violently experienced that new border. My grandparents never really spoke about it in political terms. They never spoke about the violence, the policing, the walls, the murders, mass migration—they would speak about it in other terms, in coded ways. When we do workshops, specifically with South Asians, we speak about coding. How even though our parents and our blood families may not be speaking politically, their actions and their lives are governed by structures of politics. For my grandparents to be like ‘You need to really make it in this country, and make lots of money and whatever’, I can’t de-contexutalize that imperative from their survival economy in a post-Partition sort of moment. Do you view yourselves in relation to a queer and/or South Asian literary community or just as an activist? J: I don’t see those things as separate. Obviously there are literary people that I don’t want to build community with because their politics are very different from ours. The violence of professionalizing activism or any number of things of not valuing cultural work is this false split between artists and activists. But so many people in our community are both, or have jumped in both or have had to give one up because of the demands of capitalism. So I view myself as part of a political, literary artistic cultural work community. But I’m also just trying to do my work as well. A: I feel like DarkMatter made a very strange journey that I haven’t seen often with spoken word artists. I’ve seen two traditional avenues for spoken word artists, one is to do the slam scene, and make it big through winning slams. The other is to publish a book and make it big through touring your book. But we went this third route which involved coming in through social movements. The groups that helped us perform, instead of literary groups, or spoken word groups, were actually queer groups or political groups, community centers. My art has always felt more allegiance to those sorts of communities. I think it would be a false binary to create a split between writer and activist, in which one is problematic and the other is amazing. Going forward, as we enter more into literary spaces, there is this politics of respectability that we are not really interested in participating in, in literary cultural spaces. I’m not interested in participating in the de-legitimization of spoken word, or slam. I’m not interested in people who delegitimize hyper-performance, because for me that’s racist, sexist, classist, transphobic. I’m not really interested in people who want to have a formal reading where we sit quietly and we like absorb. These things for me are inseparable from histories of creating high art and low art, which is always going to be a racist distinction. 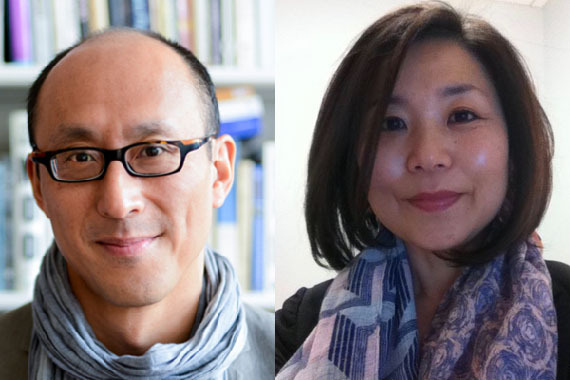 So whatever spaces we enter in terms of the literary community I think we carry with us our political critique and analysis—that art must be connected to people’s lived experiences, that art cannot just circulate as something that we talk about in our parlors. That’s not the type of art that I’m interested in. 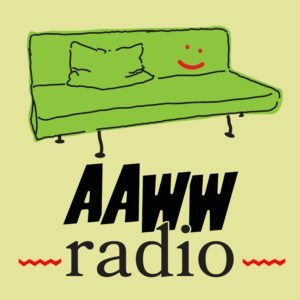 Yasmin Majeed is a student at CUNY Baruch College and an editorial intern at AAWW. Follow her on twitter @yas_maj.